This post is courtesy of our Party Tip contributor Katelyn…My fondest childhood memories came flooding back to me this holiday season and I instantly remember being five. Grandma took out white linens, pegs and arranged chairs around the living space. We took all the sheets and pinned them up on the couch cushions, or used tacks in the walls. When completed, we would bundle up underneath the structure, and pretend we were in the forest. Grandma would of course play hostess by providing camping snacks in tiny bowls, and I would light an imaginary fire to keep us warm. I owe creativity on this project to my loving grandma; I have created an all in one box for some amazing little people! To build a kit, simply find a box. No matter plain, or decorative, they will be holding all your treasures. I chose two different designs. One had a very woodland feel, and the other was modern geometric shapes-both worked perfect! Tent Sheets – Go to the fabric clearance section & buy something with a print or something themed to the child’s interests. Side note: Make sure that the fabric is light weight. 2-4 meters of fabric choice is perfect. For my kids, this is a way to get away from the electronics and distractions. Once constructed, we put the kid’s favorite blankets, pillows, toys and books inside. 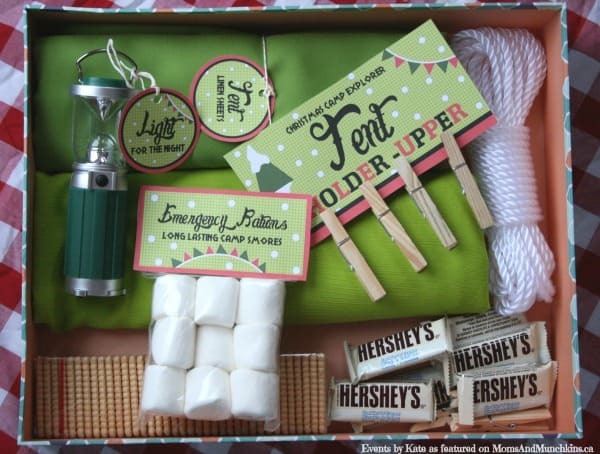 A perfect way to have a snowy Christmas, a festive birthday, or just a rainy day. I can’t think of a better way to unwind with the kids and use your imagination! 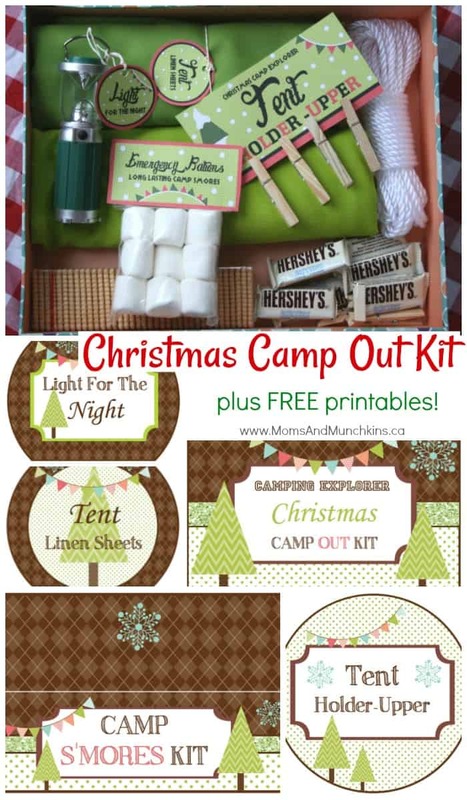 We’ve created a new FREE Christmas Camp Out Kit printable since the previous one is no longer available. Ooooh, this is tooooo cute! I’ve heard of the idea before, but I love how this is all packaged. I want to make one!! !d Thanks for sharing at For the Kids Fridays at SunScholars. I am featuring your post at this week’s party! Sooo adorable! Favorite is the tent holder-upper!! My kids would just love this and such a great gift to give. Pinning! Thank you! I’m sure everyone will have a lot of fun with it! Hi Katie! I believe the Events By Kate shop is now closed. If you are still interested in these, I can see if my printable designer could create something for you. Please let me know. Thank you! Yes I would love that!! I’ll have our designer work on it this week! Hi Katie! The new freebie is linked above! Please let me know if you have any troubles accessing the files. Thank you!